Kingsoft Writer Professional 2012 is dependable and fast word processing software that is highly compatible with Microsoft Word, and can read and edit DOC and DOCX formats. This allows you to freely transfer your office documents between Microsoft Word and Kingsoft Writer Professional. 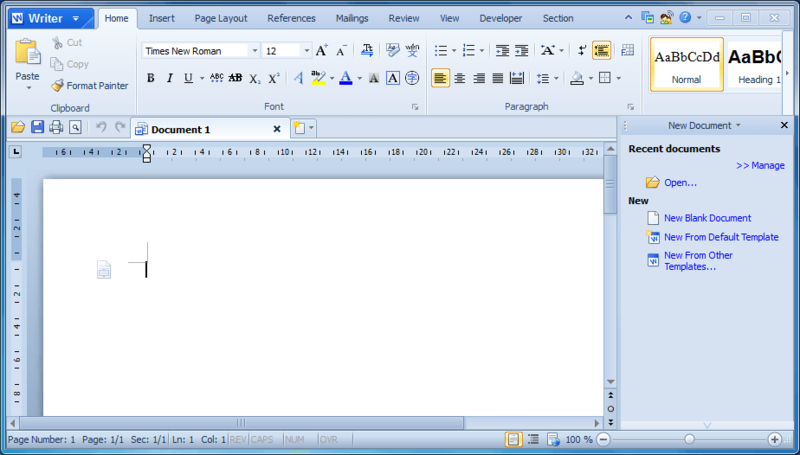 Aside from the features present in word processor Writer Free 2012, such as an automatic spell check, a PDF converter, document encryption, and multiple tabs, Professional Writer 2012 contains many new additions, such as a new interface, a section tab, a paragraph adjustment tool, a table adjustment function, and a cover page setting. Kingsoft Writer Professional 2012 is highly compatible with all Microsoft Word files. Output file formats:(97/2000/2003) .doc and dot format. Kingsoft Software is a fairly new company that has appeared on the scene offering a mix of freeware and shareware products. In this situation, the product in question is Kingsoft’s office suites. Kingsoft offers three office software: Kingsoft Office Suite Free (freeware), Kingsoft Office Suite Standard ($49.95), and Kingsoft Office Suite Professional ($69.95). Each of these office suites has a word processor (Writer), a spreadsheet program (Spreadsheets), and a PowerPoint presentation program (Presentations), with the features varying slightly between each version of the suite. The program being offered for free in this article is Kingsoft Writer Professional, the Writer that usually comes bundled with Kingsoft Office Suite Professional. There are plenty of word processors out there, all of which serve well for basic word processing and Kingsoft Writer Professional is no different. The key to a word processor is seeing how compatible it is with Microsoft Word because, frankly speaking, Word dominates the world regardless of how many cheaper alternatives popup. I tested a few Word documents in Kingsoft Writer Professional and it does fairly well in reading and editing .DOC/.DOCX files. Take note, however, Kingsoft Writer Professional can read .DOCX but it can’t save as .DOCX — it can save as .DOC. That said, if you are reading this then it is safe to assume you don’t have or want Microsoft Office. As such, you are looking for an alternative to Microsoft Office, Microsoft Word in particular. The million dollar question is which alternative office suite you should use. When asked this question I always recommend OpenOffice, an open source freeware office suite which has gained a lot of popularity in the past few years. OpenOffice is the best alternative to Microsoft naysayers; OpenOffice is stable, feature filled, works (generally) well with Microsoft Office files, and has significant public support with OpenOffice formats becoming the second most common formats after Microsoft Office. So as good as Kingsoft Writer Professional may be, it doesn’t really offer anything significant that OpenOffice Writer doesn’t already deliver (although it should be mentioned, Kingsoft Writer Professional does an excellent job in mimicking Microsoft Word’s look — you can use ribbons or traditional menus with Kingsoft Writer Professional). OpenOffice will always be the leading alternative to Microsoft Office. 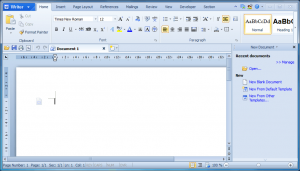 If you are looking for an alternative to Microsoft Word, you are more than welcome to give Kingsoft Writer Professional a try (Kingsoft Writer Professional is a very good word processor), but my suggestion would be give OpenOffice Writer a chance first. Update: The giveaway is of Kingsoft Writer Standard, not Kingsoft Writer Professional. My apologies, I didn’t even notice the mistake. Thank you Marc for the heads up. Kingsoft Writer Professional 2012 is being given away by Daily Software Giveaway . The giveaway ends Thursday March 15, 2012 0400 Eastern Standard Time. There is no information if you can install or reinstall at a later date. Download this ZIP file . Extract the file after the download has finished. When you extract the files you will notice there is a kingsoft_ writer_pro_daily.exe file. Run that file (double left-click on it) to install Kingsoft Writer Professional 2012. After installation you are can start using Kingsoft Writer Professional 2012, there is no need to register it — it is “pre-registered”. If you have trouble getting Kingsoft Writer Professional 2012 for free, post below and other dotTechies or I will try to help.